HHILL -- Being in the practice facility do you feel the sense of urgency or encouragement or is it as non-chalant as it appears to the fans? LEDBETTER – They are professional. Nobody is bouncing off the walls. They are a team hurt. They are realistic about their changes. Pretty hard to win when you don’t block and tackle. SIMPLEDAWG -- "Why haven't and when will the Falcons invest in a young, dynamic running back to complement the passing game and make the offense more balanced? That is....after they draft some good offensive linemen, because without them nothing else matters. Any chance they rethink the PSL scam? .....I see lots of empty seats in the Falcons future, after they price the common fan out of the equation." LEDBETTER --- Running backs are a dime a dozen now. There’s been a big shift league-wide in the value of running backs. They more likely invest heavily in another big receiver first. The PSL hustle is coming to a neighborhood near you real soon. A kindler, gentler version. Those tickets are sold. Folks are deciding that they have better things to do like go to the Bass Store and Walmart. RPENLAND - what are your thoughts on the offensive lines coaches? also what is the reason the young guys aren't being coached up properly (having a next man up mentality that is successful). LEDBETTER – Coaches Pat Hill and Paul Dunn are awesome. They are being coached up properly. They are making some mental errors and physical errors. The coaches couldn’t help Jeremy Trueblood on the first third down of the Seattle game when Chris Clemons just tossed him to the ground on the way to Matt Ryan. That wasn’t coaching. TODD OAKLEY -- Is Lamar Holmes developing into a nice tackle and does he have the ability to be a quality starter for our team for the next 10 years? LEDBETTER – Slow down a bit there. He’s improved. But I have not seen enough to make a 10-year projection on him. Would like to see some more nastiness in the run game. 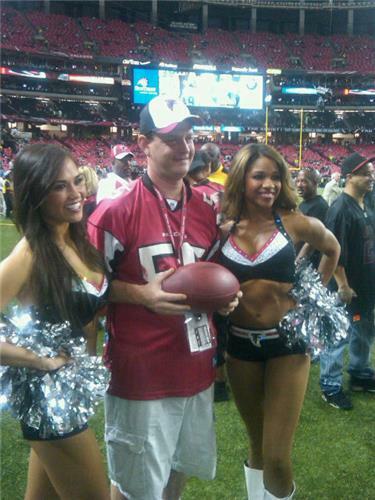 LEE -- Please please Dorlando tell me what the Falcons see in Thomas Decoud? What does he do well? Why not try Franks out there ?!! LEDBETTER – He’s a smart and heady football player with range. He gets to a lot of plays. When he’s making plays on the ball, he’s a Pro Bowler. Franks has struggled with tight coverage in the past. LEDBETTER – I doubt it. But only if they can get him on the cheap (like Osi and Steven Jackson). a new stadium but have shown you do not know how to play football? LEDBETTER – Those are two separate issues. They had five-straight winning seasons. You thought they’d never have another losing season? CARTER -- Its looks like this season is over, so in looking towards the draft, Do you see Atlanta going D-Line with Clowney or O-Line with Matthews? LEDBETTER -- I like Matthews. He could anchor the line. Don’t like the issues about Clowney and his motor. If he’s so great way does he have just two sacks? BRADFORD -- Will the offensive line actually block this week? LEDBETTER – They must or the Tampa Bay defense will destroy Ryan and Jackson. JIM PURCELL " Why does Thomas D. continue to draft #1 and #2 round draft picks with a history of injuries in college and then when they play for us they continue to get hurt ? Examples: Peria Jerry, Sean Weatherspoon, William Moore etc. Was Sam B. hurt in college? Julio Jones to a lesser degree but he had a pin in his foot when drafted and same foot injury again. Will Julio's injury be a on-going concern / problem ? Thanks, 48 year fan. I am 64 years old." LEDBETTER – That’s a legitimate question. Weatherspoon did not have an extensive injury history. Moore, Baker and Jerry had major injuries. The Falcons must be happen with the medial reports they are getting from their doctors and may be gamble that better talent outweighs any health risks. LANDY SMITH -- Our Season is completeley lost... Lets talk about some draft picks and beefing up our defensive line... oh plus a stellar running back!!!! LEDBETTER – If the Falcons keep losing this could have a shot at Jadeveon Clowney or Stephon Tuitt. Would you say it is it better to have a great offensive line or a great defensive line. Please tell me why? It seems as thought the Falcons don't have either. LEDBETTER – Offensive line would at least give you a chance to win a shootout. MAUDE -- How can you hold up you heads and look at the people of Atlanta after you DEMANDED a new stadium but have shown you do not know how to play football? FLOWERY BRANCH -- Falcons wide receiver Roddy White will be listed as questionable on the team's official injury report for Sunday's game against Seattle. White has not played in the past three games as he's been battling back from ankle and hamstring injuries. Left tackle Sam Baker (knee), defensive tackle Corey Peters (knee) and linebacker Stephen Nicholas (thigh) were also listed as questionable for the game. #Falcons WR Roddy White will be listed as questionable for Sunday's game, Coach Mike Smith said. What running back won't be here next year? Tell him I said to right the ship! LOL! I don't know. He likes the view from down there or maybe just likes to get on TV. All of that could happen. DLED, a loss by the Panthers and Saints; a win by the Falcons.....things get intresting! Got to step out to talk to Coach Smith. Will be back right before 1 p.m.
Do you ever talk to Mr. Blank? What is his vibe about the way the season is going? Hazing has been banned!!! Not wood around here. Is it true that Dimitroff personally necked Matt Ryan after the Arizona and Carolina games? Did he put Smitty in the cut, as rumored? 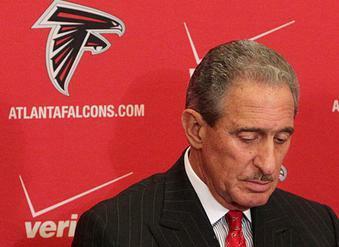 Arthur Blank wants a W on Sunday!!! I'll ask Rich McKay about the jersey deal. He's been a little busy with the Stadium. Can't anyone make the jersey? I'm surprised they wouldn't even wear the old Gritz Blitz or 1998 Dirty Birds jerseys. All he's done is win. You keep winners. I could see if he played five years of losing football or something. He needs his weapons and he can win at a high rate. He's tough and smart. I am a Matt Ryan fan, but I think I would have let him play his contract out beforeI threw him the money. Regardless, he isn't going anywhere. He is the franchise QB. I do think if he had a bad year they would not have had to give him the amount they gave hime this year. No, he quit on the Cowboys. Do you think the falcons should hav went after Jay Ratliff. Nike contract ran out. Apparently, team want's to distance itself from its mostly losing history. So we're not wearing throwbacks at all this year? There was talk of something special this season. I was expecting the 1970's red jersey and red helmet. Any truth to that? Doesn't matter, Holmes is starting at RT like last week. He might be near the end of the line. Is Trueblood in any better shape this week? He looked worn out before this week. Will Blank buy the Braves after all? I know. We are agreeing. I just said they old players should have been allowed the courtesy of getting beat out in a competition. They gave their jobs away to unproven players. (Well not Osi and Steve Jax). I'm not trying to give you a hrd time DLED. I just think moves were made prematurely, reling on players who hadn't proven anything. I was too far away to hear that. He was pacing and wondered onto the field one time. I thought they were going to get called for 12 men on the field. Any truth to the rumor that Arthur Blank yelled at Coach Smith on the sideline after the loss at Arizona? According to Coaches' film review stats: Massaquoi has 13 tackles, Goodman has 8, Maponga 2, Cliff Matthews 2. That's production?